Houston Marathon training begins next Monday! I am both excited and terrified to get started with the 16-week training plan I mapped out for myself. 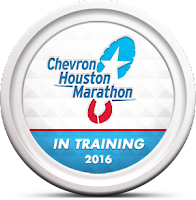 My first and only marathon was in October 2012. I had all summer and early fall to train. Houston will be different. I’m a couple years older and training will be during the fall, the start of winter and through the holidays. Generally a low mileage runner, I was a bit aggressive with my last marathon in terms of my mileage during training (I was running 5 days a week, my highest mileage week was 50 miles) yet I slowed myself down in both training and on race day to be confident I would finish. January 2016, I have a time goal in mind. I set myself up with a 4x per week plan with an option of a 5th day but I am going to increase my long run speed and focus on some mid-week workouts and strides to work on turnover. Let’s face it: I’m a wimp in the cold. December will be my toughest and most important month of training so fingers crossed for decent weather. Last year I did not run during the winter months because I’d rush home from work to fight daylight and walk Georgie before it got dark out. I will have to get into a routine and plan to fit in my running AND walk the dog after work. Although not a fan of the dark, I’d feel much safer walking the dog in the dark than running alone in the dark. This may also mean more morning walks and lunch break activities or some nighttime treadmill sessions… GROSS! If you’ve been following along with my weekly roundups, I have been training Georgie to run with me. She has gradually increased her mileage and although very inconsistent, I can usually get her to run 1-2 miles with me. She trots along at a 9-10 minute pace per mile, stops a lot and often refuses to go any further but we’re working on that. I’m really hoping I can count on her to join me on some of my easy 3-4 mile runs—or at least for the first or second half of my runs. Since buying a house and moving, I haven't fallen in love with running in my new town. I also won't have the luxury of having my mom and dad readily available to accompany me on the bike during all my long runs. I love my old running routes and hoping to still going back to their house and run a lot of my weekend long runs. (One good thing about fall and winter running, I won't have to get up at the crack of dawn to run!) I also have new running friends with great routes (thanks Wendy & Amanda!) and weekly Run Club runs to look forward to. My work schedule is consistent, yet not. Training for Chicago, I worked Monday through Friday from 8am-5pm. Keeping a training schedule was easy. My days off from running were always Tuesdays and Fridays. Now my schedule is all over the place—couple days early, one day late shift, one day long day. I am typically off on Fridays and Saturdays (long run Saturdays!) but I am occasionally training clients outside of my work hours and switching up days/times depending on staff availability. Am I up for the challenge? Absolutely. Bring it on.